Semi-Permanent Eyelash Extensions are a great way to enhance ones natural beauty and bring youthfulness to the eye. The lashes are applied individually and directly to one natural lash at a time with the use of a strong bonding adhesive. This allows the lashes to look and feel natural and beautiful, without any discomfort or heaviness. Perfect for Proms, Reunions, Holidays, Weddings, or every day wear. It is important to clean any makeup residue from your lashes before each appointment. 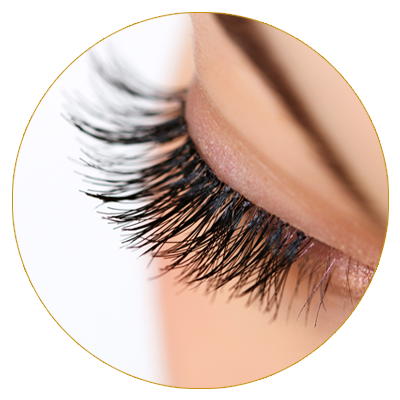 Any residue on your lashes prevent the bond from fully attaching the extension to the natural lash. If you wear contacts bring a travel case to place them in during your appointment. It’s helpful to wash your hair before your appointment because you want to avoid getting your lashes wet for 24hrs. The lash bond takes 24 hours to fully cure so it is important to avoid steam, sweating, and water during this time. Makeup remover, makeup, and facial products used around the eyes should be OIL FREE. Be gentle on them and avoid picking, pulling, or sleeping on your lashes. Be careful of high heat around your eyes such as the oven and blow dryers. And as always, Mascara and eyelash curlers are a no-no. How should I clean my lashes? Clean your lashes every night regardless if you wore makeup that day. Dirt, oil, and debris can build up on your lash line so cleansing your lashes is important for maintaining the health of your natural lashes and lash extensions. Our lash cleanser gently cleanses in between each lash and extends the life of your lashes. What is the difference between volume and classic lashes? There are two techniques in lashing; Volume and Classic. Volume is a technique in which you are safely applying handmade & customized fans of lashes using 2-6 fine extensions per natural lash. Since Volume lashes are lightweight, they can weigh less or equivalent to one Classic eyelash extension. Classic lashing is applying one extension to one natural lash. Both techniques enhance the natural lashes by thickness and length. Combined the two styles and you get Mati Studio’s signature mixed set that everybody loves! To maintain the life of your lashes it is recommended that classic fills be done every 2-4 weeks. Clients should come in for a fill when 50% of their lash extensions have shed. Clients with 40% or less of lash extensions may do a “lash add on”. This service gives the artist an extra 15 minutes of lashing time for $15. Clients with less than 30% will be considered a full set. No. This is a common myth. Eyelash shedding is part of the natural eyelash life-cycle. The average person sheds between 2-5 lashes on each eye daily. That is why it is necessary to come back for fills every 2-4 weeks. If applied correctly eyelash extensions will not hurt your natural lashes or cause premature shedding. Eyelash Extensions are synthetic micro polyester fiber thread. They are crimp-resistant, bouncy, flexible and weightless. Their natural taper and beautifully curled lash tips are the perfect compliment to natural human lashes. You should only apply water soluable mascara to your Eyelash Extensions. If you use water-proof mascara it will wear down your Extensions and cause premature fall off. Do not use oily products, mascara remover, lash curlers, lash perms, or waterproof mascara on your lashes. Your natural lashes have an approximate 100 day life span. When one falls out it is replaced with the growth of a new eyelash. A re-lash is recommended to maintain your new beautiful lashes.